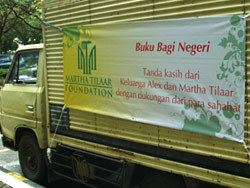 Mrs. Martha Tilaar donation of books amounts to 27 boxes, containing 4,321 books of school text books, fiction books, children�s books, and magazines, as well as 240 handwritten notebooks. The books were given by friends of Mr. and Mrs. Tilaar when they celebrated their 43th wedding anniversary. First Lady Mrs. Ani Yudhoyono will donate the books for the program Indonesia Pintar (or Smart Indonesia), which is actually part of her own program Solidaritas Istri Kabinet Indonesia Bersatu (SIKIB). 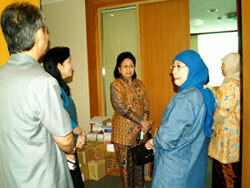 The donation was received by Ms. Widodo, as head of SIKIB, at SIKIB�s office.